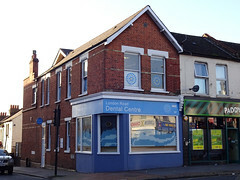 Dentists on the corner of Sumner Road and London Road. Accessibility: Three internal steps to get in. Existence last checked in September 2018. Last edited 2019-03-21 11:55:14 (version 30; diff). List all versions. Page last edited 2019-03-21 11:55:14 (version 30).